The collapse of the Soviet Union suddenly rendered ethnic Russians living in non-Russian successor states like Latvia and Kyrgyzstan new minorities subject to dramatic political, economic, and social upheaval. As elites in these new states implemented formal policies and condoned informal practices that privileged non-Russians, ethnic Russians had to react. 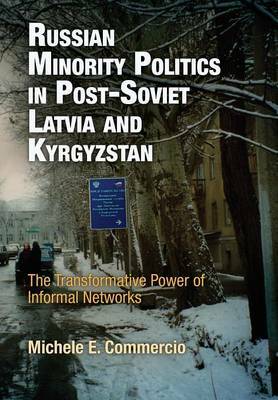 In Russian Minority Politics in Post-Soviet Latvia and Kyrgyzstan, Michele E. Commercio draws on extensive field research, including hundreds of personal interviews, to analyze the responses of minority Russians to such policies and practices. In particular, she focuses on the role played by formal and informal institutions in the crystallization of Russian attitudes, preferences, and behaviors in these states. Commercio asks why there is more out-migration and less political mobilization among Russians in Kyrgyzstan, a state that adopts policies that placate both Kyrgyz and Russians, and less out-migration and more political mobilization among Russians in Latvia, a state that adopts policies that favor Latvians at the expense of Russians. Challenging current thinking, she suggests that the answer to this question lies in the power of informal networks. After the fall of the Soviet Union, the Communist party, Komsomol youth organization, and KGB networks were transformed into informal networks. Russians in Kyrgyzstan were for various reasons isolated from such networks, and this isolation restricted their access to the country's private sector, making it difficult for them to create effective associations capable of representing their interests. This resulted in a high level of Russian exit and the silencing of Russian voices. In contrast, Russians in Latvia were well connected to such networks, which provided them with access to the country's private sector and facilitated the establishment of political parties and nongovernmental organizations that represented their interests. This led to a low level of Russian exit and high level of Russian voice. Commercio concludes that informal networks have a stronger influence on minority politics than formal institutions.